There’s one day a year that your child looks forward to more than most, and we bet you can guess what it is. Children love celebrating their birthdays, and who can blame them? From the intricate decorations and fun entertainment to a delicious, sugary cake, kids’ birthdays are the best part of the year. However, planning such an extravagant event is no small feat. 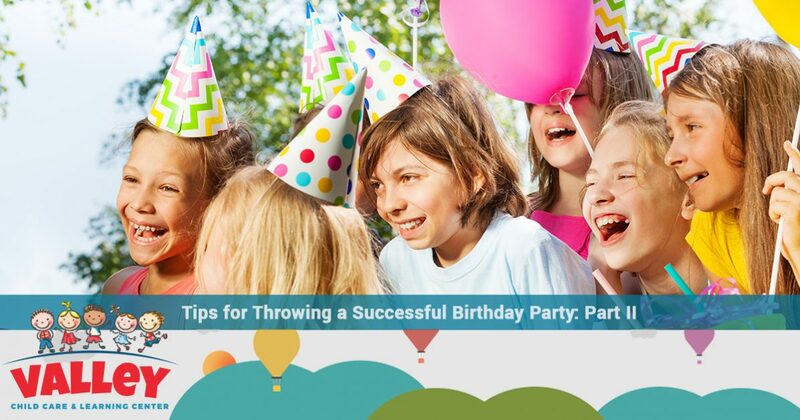 In part one of this two-part series, we gave you a few tips on how to plan a successful birthday party for your little one. As we continue with part two, we will give you even more tips for you to keep in mind. One of the best parts of throwing a birthday party is seeing your child have fun with their friends. At Valley Child Care & Learning Centers, we not only strive to create an environment that encourages learning, but we also provide your child with ample opportunities to make new friends. We offer a variety of programs, including a preschool learning program where your child can interact with children their own age. Browse our website to learn more about everything we have to offer, and contact one of Valley Child Care & Learning Centers’ 10 locations to get started today! Once you have finalized the guest list and decided whether or not to include parents and siblings in the fun, the next step is to send out the invitations. As a good rule of thumb, it’s best to send out the invitations more than a week prior to the date of the party. You want your little one to be able to celebrate with all of their friends, therefore, you need to give their parents enough time to plan ahead. With that in mind, you will also need to decide how you want to deliver invitations. In today’s society, you have a variety of different options to choose from — you can send physical copies in the mail, hand them out at school, or you can even send out a digital invitation to the parents. If you have a young child, the easiest way is probably to send out a digital invitation. Relying on your little one to hand out invitations and the other children to give them to their parents can be a risky move. If you want to ensure that everyone will be there to celebrate with your kiddo, it’s best to skip the middle-man and send out a digital invite. One of the most difficult parts of planning a child’s birthday party is defining the start and end time of the event, especially if you’re hosting the party at your home. When you plan a party for another venue, generally they will give you a certain time slot in which you can rent the space, making it easy to define when your party will begin and end. However, if you’re planning to have the party at home, you may have a difficult time deciding when the fun should end. You may think the easiest thing to do is simply leave the end time blank and let parents decide when they need to leave. Unfortunately, when it comes to children’s parties, this isn’t always the best option. For one, parents need to be able to plan out their day, and not having a specific end time to the party may make it difficult to schedule anything else on the same day as the party. Additionally, if the plan is to have parents drop their kids off and pick them up at the end of the party, you need to give them a time in which they need to come and get their child. Otherwise, you may find yourself with kids whose parents didn’t plan to pick them up until later than you anticipated. 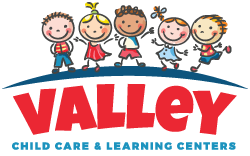 Enroll Your Child at Valley Child Care & Learning Centers Today! 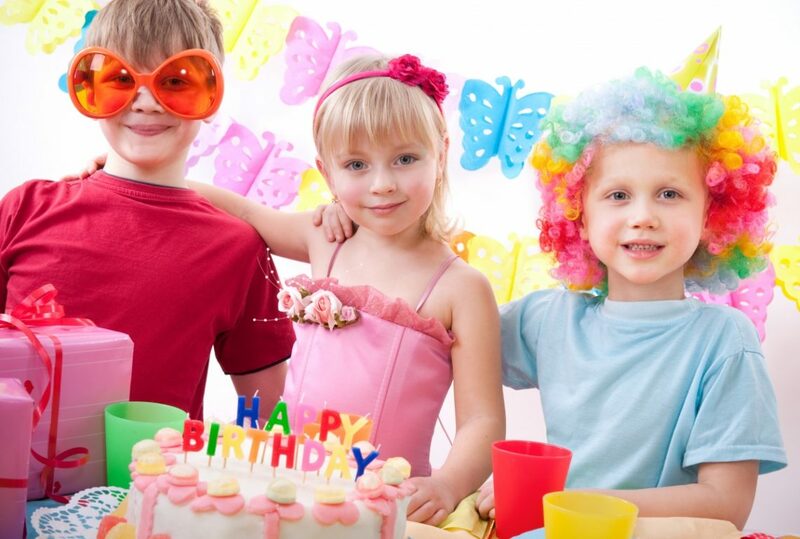 Hopefully these tips will help you when it comes time to plan your little one’s birthday party this year. If you’re looking for a great way for your child to make new friends, then look no further than Valley Child Care & Learning Centers. We take pride in offering an environment that encourages children to learn, grow, and interact with their peers. Whether you’re interested in infant care, toddler care, or a preschool learning program, we’ve got it all! Browse our website to learn more, and contact Valley Child Care & Learning Centers in Phoenix today.